Brian Delaney and Lisa Walford, who are both experts in the field of anti-aging nutrition, are the authors of The Longevity Diet. It is based on the principle of calorie restriction which is the only method scientifically supported to have the potential to increase maximum human life span. In addition to the possibility of a longer life, those that follow calorie restriction have reported dramatic results with fast reductions in their cholesterol and blood pressure levels as well as the loss of excessive body fat. 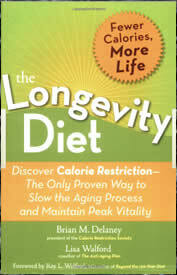 Update: A new updated version of the Longevity Diet has been released in 2010. The concept of the Longevity Diet is simple: eat fewer calories and select foods that have a high concentration of vitamins and minerals. The idea is that you will achieve all of your recommended intakes of key nutrients while reducing your intake of calories to approximately 20% below normal amounts. The authors emphasize that calorie restriction is not just about eating less food but about consuming fewer empty calories. Everything that you eat should consist of high quality foods that supply maximum nutrition with minimal calories. Whole grains are always preferable to their processed counterparts and a minimum of five serves of fruit and vegetables are to consumed every day. Meats should be limited especially those that are high in fat. Dieters who wish to avoid meat are advised to consume some legumes and grains every day. Red wine is allowed in moderation because research suggests that it contains a compound called resveratrol that may slow the aging process. Blueberries, red cabbage, grapes, figs, olives, beets, tomatoes, spinach, apples, romaine lettuce, Napa cabbage, broccoli, kale, collard greens, prunes, walnuts, flaxseeds, cottage cheese, tofu, egg whites, whole grains, legumes, salmon, sardines, chicken breast, sea vegetables, olive oil, red wine. Look for more low Calorie healthy meal ideas here. At least twenty minutes of aerobic exercise is recommended a minimum of three days a week. Additionally resistance training and yoga are advised to reduce the risk of developing osteoporosis and to maintain muscle mass. Update: The new version of The Longevity Diet has a chapter on the benefits of Yoga. Scientifically supported to increase potential human life span. Reduces the risk of developing many chronic diseases including cancer, diabetes, and heart disease. Can be adapted to suit individual food preferences and lifestyles. Allows inclusion of red wine, coffee, and chocolate. Includes calorie information for a wide variety of foods. Not suitable for those with a history of eating disorders. Some dieters may experience hunger, especially initially, or when insufficient quantities of vegetables and other high fiber foods are included in the diet. May increase the risk of osteoporosis especially if sufficient weight bearing exercise is not undertaken. Requires dieters to keep track of their intake of food and to count calories. Will probably require more time to be spent on food preparation. The Longevity Diet will most appeal to dieters who are concerned about reducing their risk of developing the chronic diseases that are associated with aging. This way of eating is also the only method known to potentially increase the human life span, which may attract some dieters. This diet is not specifically targeted towards weight loss, however, by reducing calories dieters should naturally achieve their ideal weight when following this program. However, continuing to restrict calories at this point may result in weight loss beyond that which is desired for most individuals.